This story is reprinted from the February issue of GCU Magazine. To view the digital version of the magazine, click here. Rejection is difficult for most people to handle, and it can hurt even more for a college student identified with autism spectrum disorder. The inability to read social cues prompted Austin Forney, a Grand Canyon University student with ASD, to lose confidence and self-esteem. But encouraging words from fellow GCU Young Life members, amid a self-affirming camping trip, helped pull Forney out of his sad state. His mother, Melissa Pullon, was incredibly relieved. “Little pieces of encouragement just kept showing up,” she said of her son’s challenging sophomore year. “Almost like every time we got to the place where we were on our knees, praying, ‘Lord, what are we going to do with Austin?’, someone would show up and inhabit the Gospel for him. Dr. Tim Griffin, Pastor and Dean of Students, and Worship Manager Jared Ulrich were among several adults who supported Forney. 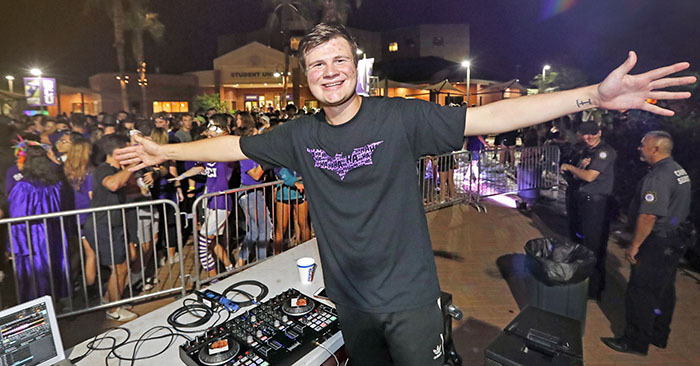 Austin Forney loves mixing music for the post-Midnight Madness party on the Promenade. (Photo by David Kadlubowski). Federal law provides accommodations for students who self-identify with ASD, and the University complies by providing accommodations, both academic and in residence halls, for students on the spectrum. But the culture of GCU also is an important factor in welcoming students with ASD while benefiting from their unique talents. The University’s rapid growth has been accompanied by an increase of students with ASD. By federal law, they are not required to self-identify and some do not, out of a desire to be independent and part of the mainstream. At the same time, GCU’s Student Disability Services (SDS) provides activities for those who desire social experiences in smaller settings in a new program called ASD Connection. Moreover, professors support students through approved accommodations. Overall, GCU’s approach is organic – the kind, helpful culture permeating campus often proves to be the most effective method for welcoming and including students identified with ASD and helping them deal with situations that make them feel overwhelmed. “We have a high value at GCU to be considerate, to be kind, to be caring, to be loving,” Griffin said. “From my vantage point it stems from a set of Christian values and principles that we try to live by and try to encourage in each other. From a faculty-to-student perspective, communication and collaboration are essential. For example, Dr. Sherman Elliott, Dean of the College of Humanities and Social Sciences, frequently shares with faculty his insight gained from experiences with his son, Ethan, who is identified with ASD. “They hear about it a lot from me,” Elliott said. “For the vast majority of autistic learners, school is a very stressful, painful environment. Some are thought of as super smart, so therefore some people think all autistic people are like that. That is one of the greatest misnomers that has to be taken care of. Television shows do that and journalists write about the extraordinary; those are the autistic savants. An autistic savant is a minority of the autistic population. When faculty members describe certain behaviors to Elliott, he observes the student in class. Among the behaviors he sees: inability to follow directions, speaking out of turn in class, not raising their hand, raising their hand too much, talking too much, saying the same thing repeatedly, or writing about an entirely different assignment. Elliott, who has researched ASD and attended numerous social and emotional training sessions, is quick to point out that despite the list of common behaviors, there are infinite exceptions. Forney, for example, loves loud music and has an uncanny knack for mixing sound. In 2017-18, he mixed music for Chapel and The Gathering. In August, he began working as a disc jockey for athletic events. Through the efforts of random students, acquaintances and friends, along with staff members all across campus – from Matt Hopkins, Director of Resident Life, and his Resident Directors and Resident Assistants, to Griffin and the Spiritual Life staff, to Beth Jamison and her SDS staff, to the entire faculty – GCU strives to embrace students on the spectrum.